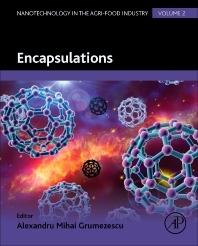 Encapsulations, a volume in the Nanotechnology in the Agri-Food Industry series,presents key elements in establishing food quality through the improvement of food flavor and aroma. The major benefits of nanoencapsulation for food ingredients include improvement in bioavailability of flavor and aroma ingredients, improvement in solubility of poor water-soluble ingredients, higher ingredient retention during production process, higher activity levels of encapsulated ingredients, improved shelf life, and controlled release of flavor and aroma. This volume discusses main nanoencapsulation processes such as spray drying, melt injection, extrusion, coacervation, and emulsification. The materials used in nanoencapsulation include lipids, proteins, carbohydrates, cellulose, gums, and food grade polymers. Applications and benefits of nanoencapsulation such as controlled release, protections, and taste masking will be explained in detail.